As Christians, we must be aware of the fact that we are involved in warfare. One of Satan’s main strategies has been to blind our eyes to the conflict we are in, and thus make us defenseless against his attacks. 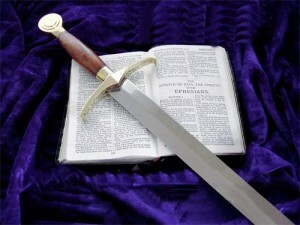 But God has given us every weapon we need to be victorious over our enemy! It is important to remember that these weapons are not of the natural world. They are of the spirit. Many of the writers of the New Testament used terms of warfare. These are not symbolic terms, but rather actual descriptions of the battle in which we are engaged. These battles are to be conducted in the spirit arena. One of the most important things to learn is that our warfare is not with people. It is against Satan and his evil spirits. It is in the spirit realm. Getting into conflict with people only leads to frustration and defeat. If we know that we are at war, it is important to establish who our enemy is. The apostle Paul describes our enemy quite graphically. He told us our struggle was not with the people around us. He said we wrestle not against flesh and blood. Peter made it clear that our adversary is the devil. The devil’s wiles are his schemes, strategies and plans of deception, which he uses against us. He has a military- type battle plan to use in his attempt to defeat us. However, as we become aware of his plans, we must become more aware of the armor and weapons that God has provided for our battle. The armor is for our defense. The weapons are for our victorious offense against our enemies. We are not to become preoccupied or overly impressed with the devil, his demons, or his schemes. Instead, we are to be occupied with Jesus. As we keep our eyes on Him, we will become aware of who we are in Him. As we become aware of our restored authority through Jesus, a boldness will arise within our spirits. We will not be intimidated by the devil or his schemes. God is eternal. He has always existed and He is the Creator of all things. As the Son of God, Jesus created all things including the angels. They were not only created by Him, but they were created for His divine purpose. Col 1:16, 17 For by him were all things created, that are in heaven, and that are in earth, visible and invisible, whether they be thrones, or dominions, or principalities, or powers: all things were created by him, and for him: And he is before all things, and by him all things consist. When Paul listed thrones, dominions, principalities and powers, it was a reference to angels. He used terms that referred to their functions. Since we know that Jesus created all things, we know that He created Lucifer. Lucifer’s original position was one of highest honor. One of his titles was Morning Star. Both the prophet Ezekiel and the prophet Isaiah give us an insight into Lucifer’s description. Ezekiel 28:12b Thus saith the Lord GOD; Thou sealest up the sum, full of wisdom, and perfect in beauty. Eze 28:13a every precious stone was your covering, sardius, topaz, and diamond, beryl, onyx, and jasper, sapphire, emerald, and carbuncle; and crafted in gold were your settings and your engravings. Timbrels are the percussion musical instruments. Pipes are the wind instruments such as a flute. Isa 14:11:a ..and the noise of thy vials..
His voice sounded like a great orchestra. Even as the cherubs were on both sides of the mercy seat covering the Ark of the Covenant (Exodus 25:18-22), Lucifer was next to God in the place of greatest honor. As the Morning Star or Son of the Dawn, he covered and protected God’s throne and reflected God’s radiance and glory. He was anointed as a guardian cherub. He was entrusted by God to the place of greatest responsibility. From the description of his musical voice, it appears that he led all the angels in their praise and worship of God and that he guarded God’s throne with a covering of praise and worship. Understanding Lucifer’s rebellion, fall and the resulting warfare in heaven, gives us an understanding of the significance of the warfare that we are now engaged in on earth. Eze 28:15-17 Thou wast perfect in thy ways from the day that thou wast created, till iniquity was found in thee. Lucifer was perfect until he centered his attention on his own beauty instead of on the beauty of the One who had created him. Pride entered. He thought about his own brightness instead of keeping his attention on the radiant brightness of God Himself. There was one will, the will of God, that ruled the universe until pride entered into Lucifer. Until this moment there had been only one will in the universe – the will of God. In rebellion, Lucifer exercised his will in opposition to the will of God. As expressed in the five “I wills” of Lucifer, the deception and expression of his rebellion was progressive to the point of attempting to replace God upon the throne in heaven. Lucifer and his angels were cast out of heaven. One-third of the angels were under Lucifer’s command and they fell with him. Other angels, under the command of Michael and Gabriel, remained faithful to God. Lucifer and “his angels” were flung down to the planet earth. The angels under Lucifer’s authority, those who followed him in rebellion, kept their organizational structure of thrones, powers, rulers, and authorities, but their names were changed to reflect their fallen nature. They were now called demons, devils, evil spirits. the one who guarded and protected the throne of God. This was all the result of his sins of pride and rebellion. 1. Describe the original function and position of Lucifer. 2. Describe his rebellion, fall and the warfare that resulted. 3. Who is the real enemy of believers today?